In this film adaptation of Henrik Ibsen's classic play, precocious socialite Hedda (Rita Ramnani) has recently returned from her honeymoon with a young scholar named Jorgen and soon discovers she's pregnant with his child. 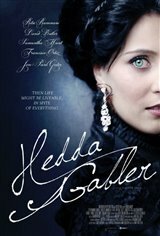 Unfortunately, Hedda has little more than amused contempt for her new husband, and has come to loathe the boredom of married life and motherhood. But when an old flame makes a sudden reappearance, Hedda's banal world is turned upside down — for better and for worse.